Honzawa Plum Garden (本沢梅園) is one of the Japanese plum spots located in Sagamihara, Kanagawa Prefecture. 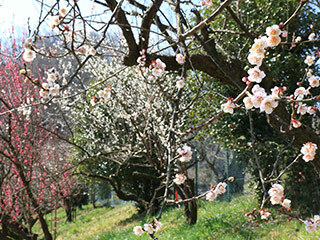 There are about 1,000 plum trees that bloom around the end of February to the middle of March. There is an event during the season. Period: From the beginning of March to the middle of March. 1. use JR Chuo Line to Takao Station. Honzawa Baien is a plum garden located in northern Kanagawa Prefecture. There are about 1,000 plum trees that bloom in early March.